St. Martin's Griffin, 9780805087222, 272pp. In this powerful and provocative manifesto, Bill McKibben offers the biggest challenge in a generation to the prevailing view of our economy. For the first time in human history, he observes, "more" is no longer synonymous with "better"—indeed, for many of us, they have become almost opposites. McKibben puts forward a new way to think about the things we buy, the food we eat, the energy we use, and the money that pays for it all. Our purchases, he says, need not be at odds with the things we truly value. 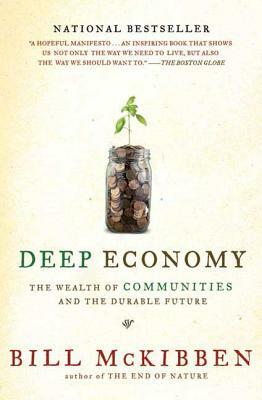 McKibben's animating idea is that we need to move beyond "growth" as the paramount economic ideal and pursue prosperity in a more local direction, with cities, suburbs, and regions producing more of their own food, generating more of their own energy, and even creating more of their own culture and entertainment. He shows this concept blossoming around the world with striking results, from the burgeoning economies of India and China to the more mature societies of Europe and New England. For those who worry about environmental threats, he offers a route out of the worst of those problems; for those who wonder if there isn't something more to life than buying, he provides the insight to think about one's life as an individual and as a member of a larger community. McKibben offers a realistic, if challenging, scenario for a hopeful future. Deep Economy makes the compelling case that the more we nurture the essential humanity of our economy, the more we will recapture our own.